Churches are considered “sensitive locations” by ICE, which means they are generally not allowed to conduct enforcement operations there. Jose Robles was supposed to be on a plane back to Michoacan, Mexico, at 6 a.m. Thursday, but he packed his bags and went to Gethsemane Lutheran Church in downtown Seattle instead. He said he felt fear and anxiety driving to the church for sanctuary to avoid deportation. Churches are considered “sensitive locations” by U.S. Immigration and Customs Enforcement (ICE), which means they are generally not allowed to conduct enforcement operations there. Robles was referred to Gethsemane Lutheran Church by The Church Council of Greater Seattle, which is connected to more than 300 religious congregations. The Church Council has been organizing vigils and demonstrations in the wake of family separations that have removed more than 2,000 immigrant children from their parents. It is unclear whether there are other undocumented immigrants being given sanctuary in the Seattle area. Michael Ramos, executive director of the Church Council, said this is the first sanctuary situation made public. 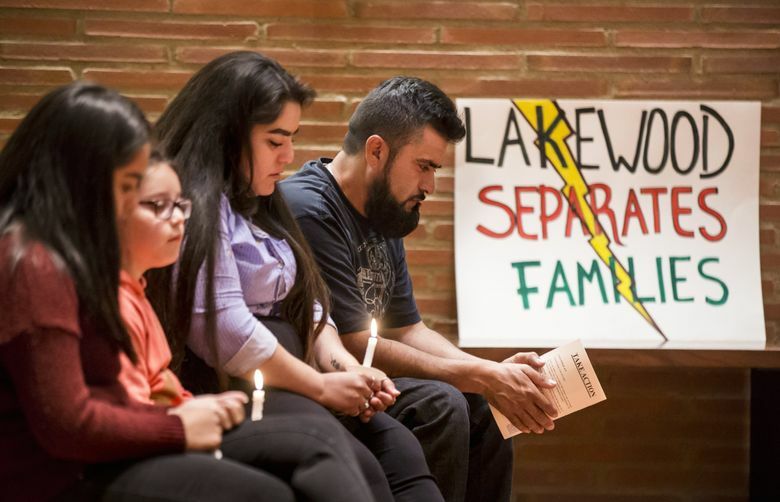 Gethsemane Lutheran Pastor Joanne Engquist said her congregation committed to being a sanctuary on April 9, 2017. Robles is the first person provided sanctuary by the church, she said. The church is prepared to provide sanctuary and necessary amenities to Robles for as long as he needs it, said Engquist. “We are relying on the wider community of congregations and faith leaders to bring food, conversation, medical and personal needs in this space to keep him comfortable,” she said. Robles has lived in the U.S. for 18 years and lived in Lakewood for the past decade. He owns a painting company, but can no longer work while he’s in sanctuary. Donations were being accepted Thursday evening after a vigil held to bring attention to Robles’ cause. Robles doesn’t know when he will be able to leave the church. Robles has been trying to apply for a U-Visa, which is given to certain undocumented immigrants who are victims of a crime and are cooperative with law enforcement in an investigation. In April, Robles said he was held at gunpoint and beaten while trying to get a haircut. Lakewood officials need to sign off on the U-Visa for Robles to qualify, but haven’t. “We aren’t asking them to change the report, just to verify that it in fact did happen to me,” Robles said. Robles says he had two traffic offenses, which, according to records, are for negligent driving. Robles’ family is using every tool they have available to stay together. The family were together at the church on Thursday before the 5:30 vigil to learn about how to get the word out on social media. More than a dozen of his family members showed up. Daughters Brenda Robles, 24, and Yuritzy Robles, 19, both have Deferred Action for Childhood Arrivals status, sometimes referred to as Dreamers. Brenda said though she has DACA she feels like she isn’t safe anymore, and said her 8-year-old sister, Natalie Robles, has growing anxiety from the situation. “She’s in shock and just hoping he doesn’t have to go anywhere” she said. Their mother, Susana Gaytan, said Natalie hasn’t been the same since it became apparent that her father would get deported.